We may not think anything of John Bunyan other than his wonderful Pilgrim’s Progress and even with that we would be miles ahead of those who don’t know him. Yet I have found that his other books open a door to Bunyan that I did not know even from reading his great allegory. Bunyan was a respected speaker and writer of his time. His books show a depth of thinking and a careful use of Scripture very typical of dissenting believers in those days. His book Advice to Sufferers is the best I’ve ever read on the subject of Christian trials. However, when it comes to prophetic things Bunyan was not necessarily in our pretribulational, premillennial camp, those categories not being too familiar in his day. In speaking of the antichrist Bunyan typically makes the Roman Church the embodiment of him. Bunyan speaks of the antichrist as having body, soul, and spirit. His spirit and soul always dwell in the world of lost men, the devil himself empowering the spirit. 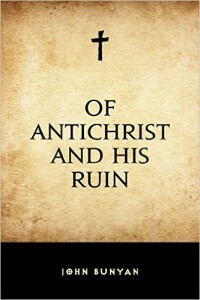 But the body of antichrist is seen primarily in the Catholic Church, the great evil of his day. “Take things therefore more distinctly, thus: The antichristians’ spirit, is the heaven of antichristians; their sun, moon and stars, are their superstitious ordinances; their earth is the body of flesh of Antichrist, otherwise called the church and synagogue of Satan.” Further on he writes, “For as concerning his masses, prayers for the dead, images, pilgrimages, monkish vows, sinful priests, though when the spirit of Antichrist was in them, they did bear some sway in the world; yet now, of what esteem are they? Or who has reverence for them? . . . . As therefore the burning fiery furnace, and the den of lions, were the support of the horrible religion of the Babylonians of old; so popish edicts are the support of the religion of Antichrist now.” Interestingly, Bunyan saw God destroying antichrist by providences throughout history, even in the way the English Church displaced the Catholic Church. He writes, “As the noble king, king Henry VIII did cast down the antichristian worship; so he cast down the laws that held it up: so also did the good king Edward his son. The brave queen, queen Elizabeth also, the sister to king Edward, hath left of things of this nature, to her lasting fame behind her. And if one such law of Antichrist hath escaped the hand of one, another hath taken it, and done that execution on it that their zeal and piety prompted them.” And interesting but surely lacking view of the destruction of antichrist.